Shri Arvind Mafatlal Prabhuji’s comments on HH Radhanath Swami Maharaj are very appropriate. Future generations will learn a lot from his life, his teachings & his books. I love this book which is full of prayers not only theorotical but their practical applications through exhibition of dependency on Lord at every moment is really inspiring. I liked comment of Mr mafatlal on the book of Radhanath Swami Maharaj. This book will help the future generations a lot. I completely agree with the comment. Radhanath Swami Maharaj’s experiences will surely be guiding light for the fututre generations. Arvind Mafatlal is himself a very spiritually inclined spiritualist. The book is full of enlightenment. Very true. 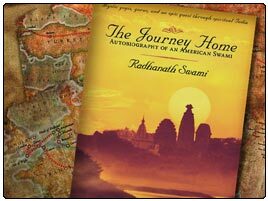 By his book, Radhanath Swami has opened the door to the spiritual world for all of those who are sincere seekers of the Absolute Truth. This book will induce a sense of urgency in every sincere spiritual seeker. A perfect and proper comment by Shri Mafatalal.Thank you very much. this is very crisp and to the point review of Radhanath Swami’s book. It is a book for all sincere seekers – be it young or old! Thank you Swamiji! All Descriptions and praises are something that give us more and more inspiration to become serious and earnest on our path of spirituality. Thank you for the reviews on this website.